PProfessor Ken Eddy started his martial arts career in 1964 when he began the study of Kukishin Ryu JuJitsu with Shidoshi Robert Osmond. After training for six and a half years, he started the intriguing art of Chinese Pau Kua and TCM under the tutelage of Master Samuel Lee Wong D.O.M.. After 2 and a half years, Master Wong went back to Hong Kong and Professor Eddy moved on to Danzan Ryu JuJitsu. Totally intrigued by this style of the martial arts, Professor Eddy trained daily and found the most diverse system of jujitsu in practice today. Professor Eddy has studied with some of the systems original students and has received “KaidenSho” certification from the American Jujitsu Institute as well as Shihan Sig Kufferath (deceased), one of Master Okazaki’s original students and a Judan in Danzan Ryu JuJitsu. Professor Eddy has also studied with Prof. “Bud” Estes (deceased), Prof. Antone Gonzales (deceased), Prof. Jack Wheat (deceased), Prof. Carl Beaver (deceased), Prof William Montero (deceased), Prof. Ramon (Lono) Oncho (deceased), Prof. Wally Jay (deceased)and had the privilege of receiving “seifukujutsu” treatments as well as Nihon Kaifuku Anma instruction from Hachiro Okazaki, (Master Okazaki’s son, now deceased) and had the opportunity of attending a clinic from Hachiro Okazaki on the Anma. All were original students of Master Henry S. Okazaki. Professor Eddy was proud to be under the directorship and guidance of Prof. Francisco Limbago (now deceased), Judan and President of the American JuJitsu Institute. Professor Eddy has a Bachelor of Science Degree in Allied Health Science with emphsis on Alternative Medicine and a Doctorial certificate from the Institute (school) of Oriental Medicine-Hongkong in 1986 under the tutelage of Dr. Samuel Lee Wong. Professor Eddy Recieved Instructor Certification for “Seifukujutsu from the American Jujitsu Institute and currently teaches jujutsu in his school “Mizu Shin Tao” (Japanese sp; Chinese sp. ), where he also teaches Oriental Therapeutic Techniques. Professor Eddy also teaches Oriental Medicine through the University system; Oriental Massage Therapy techniques as well as traditional medical application. Associate Professor Tom Rennie began his martial arts training in the 1980s studying Shotokan Karate, and Iwama Aikido. Rennie Sensei received his Shodan (1st Degree Black Belt) in Aikido while studying under Sensei Wolfgang Bomgartner, Rennie Sensei later began training under Sensei Kim Peuser. Rennie Sensei is a Yodan (4th Degree Black Belt) in Aikido. Rennie Sensei continues to study and teach Iwama Aikido (see class schedule for details). Rennie Sensei began studying Kodenkan Danzan Ryu Jujutsu under Professor Ken Eddy in 1990, and in 2010 Rennie Sensei received his Rokudan (6th Degree Black Belt) in Kodenkan Danzan Ryu Jujutsu. Rennie Sensei teaches both Aikido and Jujutsu classes. On September 29th, 2012 Sensei Rennie was given the title of Associate Professor in Danzan Ryu Jujitsu. This was in recognition of his indepth knowledge and great teaching ability. In jujitsu we now address him as Prof. Rennie, an honor well deserved. I began studying martial arts at the Bushidokan in Sparks, NV in 1985, but only stayed with the school for a year. I was ten years old. In 1986 or 1987, I discovered Iwama-style aikido and met Assistant Professor Rennie, who also studied aikido, and Geza Budhi, who taught me the basics of Shotokan karate. After a few years of training aikido and karate, I was introduced to Professor Eddy and started learning Danzan Ryu jujutsu at Mizu Shin Tao, which became more like a family to me than a martial arts school. I explored the sport side of martial arts during high school through kickboxing with Rick Dunn and Russ Tate and, briefly, through wrestling at Reno High School. I stopped training altogether for a few years, though I stayed in contact with the school. The lack of training left me feeling restless and unfulfilled, and I decided to try a different martial art. I then studied Shaolin Five-Animal kung-fu for two years under Bruce Kanzelmeyer. After yet another break in training, I returned to Mizu Shin Tao to continue studying jujutsu and chi gung under Professor Eddy, and Iwama-style aikido under Assistant Professor Rennie. I also enjoy teaching a children’s jujutsu class that allows me to give back to the school that has given me so much, and bring my own children up in this jujutsu family. I hold a first degree black belt in aikido, and third degree black belt in jujutsu—the only arts I was ever officially tested in. I took my first oriental massage class from Prof. Eddy through TMCC in 1998. I loved the rewards of bodywork, and attended many hands-on classes in Seifukujutsu, acquiring over 2300 hours of instruction and practice. After witnessing the countless benefits of bodywork enjoyed by my family and friends over the years, I decided to focus on a career in massage therapy. I find using massage therapy to help people balance and integrate their minds, spirits, and bodies both enjoyable and fulfilling. When Mizu Shin Tao opened in XXXX, I became a martial arts student, as well as a student of the healing arts. I was fortunate enough to study with Jason Spencer Sensei, Albert Brady Sensei, Shane xxxx, and countless other students under the direction of Prof. Eddy. Rennie Sensei has also been a major influence in my practice due to his insistence of commitment, fluidity, and grounding being present throughout every movement. I believe the traditional teachings of Danzan Ryu Jujitsu provided by Prof. Eddy have fostered many accomplished martial artists, who continue to train and lend their experience to Mizu Shin Tao. Mike Burns Sensei and Dave Kahan Sensei are incredible influences on the more novice students like myself. I was very thankful to receive the rank of Shodan in April 2012 after many years of study. I am proud my two sons have begun to train with Jeff Opfer Sensei to begin to discover the many benefits of the Danzan Ryu system. Recently I have been introduced to ChiGung and enjoy the peace and strength it brings to my practice. Carees Gonzalez has been a yoga practitioner for almost 6 years. The first classes she attended were traditional Hatha Yoga and therefore included meditation and pranayama (breath-work). She is grateful she was exposed to those aspects of Yoga early in her practice as they have become the most important parts she shares with her young students. 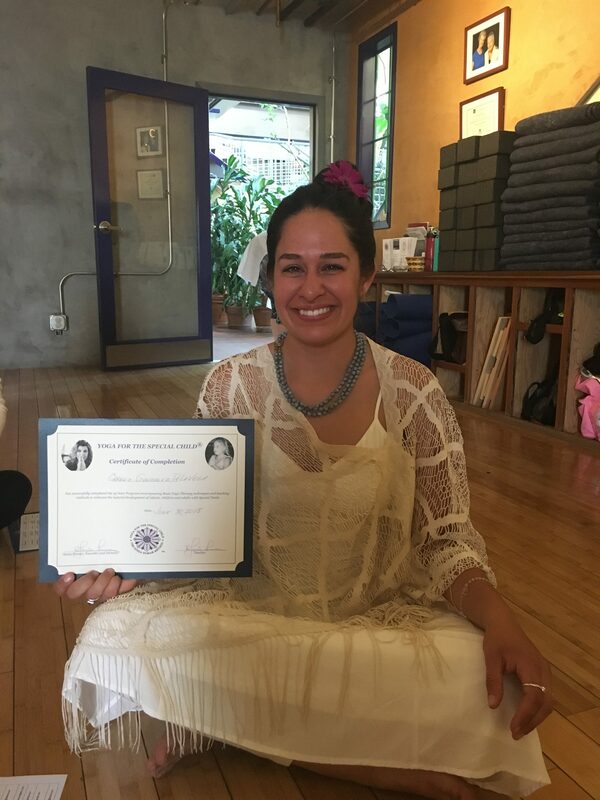 In 2015 Carees completed Angie Fraley’s 200-Hour “Om2yoga” teacher training. By the end of the training Carees had developed an interest in teaching yoga to kids. At that point she had been working with kids professionally for almost 7 years. In 2016 she enrolled in the Yoga for the Special Child (YSC) teacher training and has since graduated from the 95-hour Basic One and Basic Two programs. She is a licensed Yoga for the Special Child instructor as of 2018. Carees started attending Qi Gong classes in 2017 with Prof. Ken Eddy and Sensei Melissa Wiseman. After attending classes for about a year she began to further her study by taking more classes and began the study of Oriental Medicine through Prof. Ken Eddy. Currently, to help her education within Oriental Medicine and Martial Arts, she is the assistant teacher for Mizu Shin Tao’s Medical Qi gong classes for Neurological Disorders.